The Punisher has always held a special place in my heart. Unlike other superheroes, he has no superpowers, only his military training and experience, and a burning desire to purge the world of evil. Unlike Batman, he prefers a permanent solution to crime by slaughtering the wicked wherever he finds them. He was also my first 'proper' introduction to American comics. When I heard of the 2014 incarnation of the Punisher, I was overjoyed. 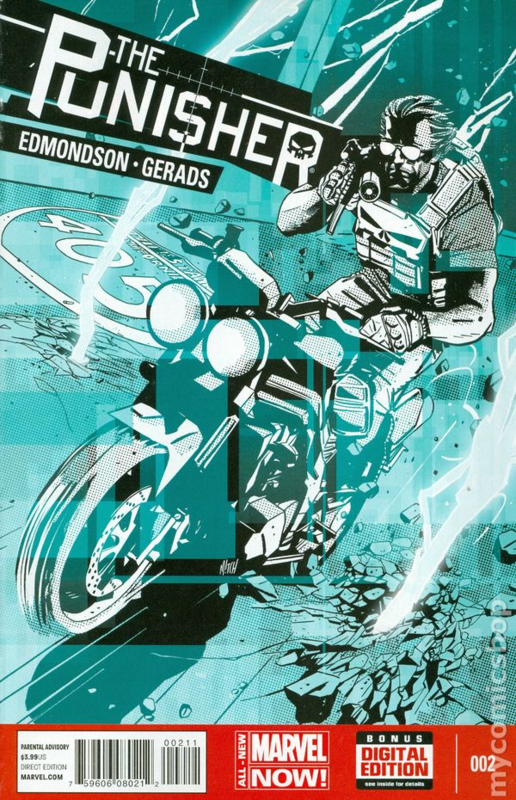 Written by Nathan Edmondson and illustrated by Mitch Gerads, it drew inspiration from real-world Special Operations Forces and promised a realistic reinterpretation of the original character. 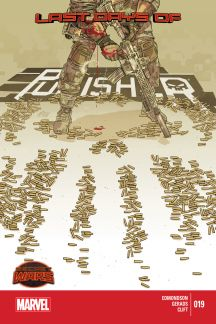 Edmonson and Gerads had previously worked together on The Activity, a military thriller series that focused on the shadowy Intelligence Support Activity, and I was confident that they would do this version of the Punisher justice. I guess I had set my hopes too high. The Punisher 2014 makes a few radical changes from the Punisher's established backstory. Once based in New York, the Punisher has now moved west to Los Angeles in pursuit of a ruthless drug cartel. There is no Microchip running backup; instead a soldier named Tugg supplies the Punisher with limitless quantities of weapons, armor and ammo. Most of all, in the original series, Frank Castle was a Vietnam veteran; here, he served in Iraq before becoming the Punisher. I can understand the changes. The plot required a move to LA, the plot didn't require Microchip's tech skills, and Frank Castle the Vietnam vet would be too old to pull the stunts he does in this series. The stunts is where the series falls short of my expectations. The series is filled with real-world weapons and equipment. Every few issues you'll see references to top-end manufacturers like Crye and Noveske. Gun geeks will instantly recognize the guns and gear in play, and will appreciate some of the jargon thrown about. But an operator is more than just his guns, gear and jargon. He is defined by his mindset, training, tactics, and his ability to adapt, improvise and overcome. I don't see much of this in the series. While there are plenty of action scenes, they are fairly generic. You see the Punisher mowing down hordes of gunmen, torturing and being tortured, and employing enough explosives for a Michael Bay film, but you rarely see him using his brain. There are few portrayals of tactics and maneuvers, deception or tradecraft, or anything that definitively says the Punisher is a bona fide operator as opposed to a random Hollywood hero. Contrast this with the creators' previous series, The Activity. Here, the characters use a mix of creative problem-solving, quick-thinking, deception, tactics and sheer ruthlessness to achieve their goals. The creators had made their bones with a series about operators acting like operators, but there is little of this influence in The Punisher. 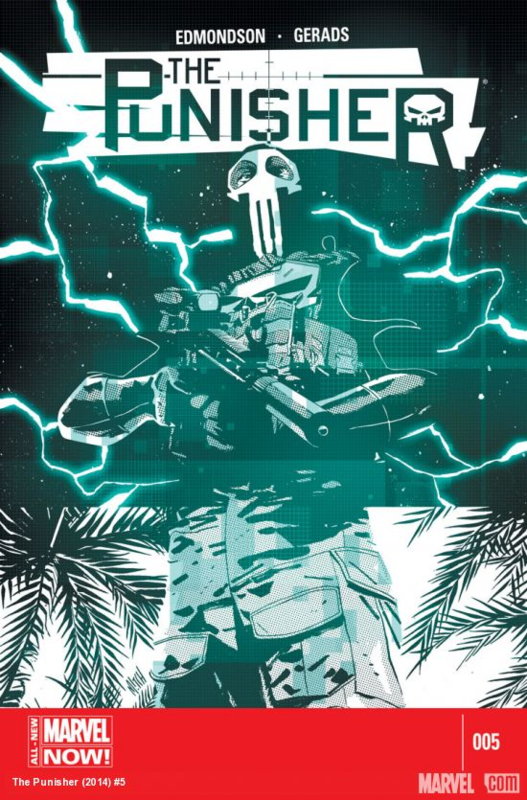 Granted, The Activity follows a team of operators on espionage and intelligence operations, while The Punisher is an action-oriented series focusing on a loner. There is more space for brainwork and tradecraft in the former than the latter. Even so, characters like Mitch Rapp, Jack Reacher, Court Gentry, Jason Bourne and Tim Rackley demonstrate how to combine the gritty realism of proper tradecraft and mindset with the romance and improvisation of the lone operator. In the Punisher 2014, I expected more of John Rambo, the protagonist of First Blood, and less of John Rambo, the Hollywood action hero. The Punisher is called 'the operator of the Marvel Universe', but the only times he's seen operating operationally is when he allies with someone else. In one sequence, the Punisher teams up with a Special Forces soldier to escape captivity, and there the series finally shows the Punisher's military expertise. The rest of the time, he's simply running and gunning like Hollywood action heroes do. Indeed, one group of antagonists, the Howling Commandos, have a better claim to being called operators than the Punisher. They display teamwork, think outside the box, aren't afraid to get their hands dirty, and make full use of everything and everyone they can get their hands on. This approach distinguishes them from the generic gunmen that populate modern movies and games. Although this Punisher wasn't as much of an operator as I thought he might be, I thought I could at least enjoy the story. That almost happened. To its credit, the series started well. 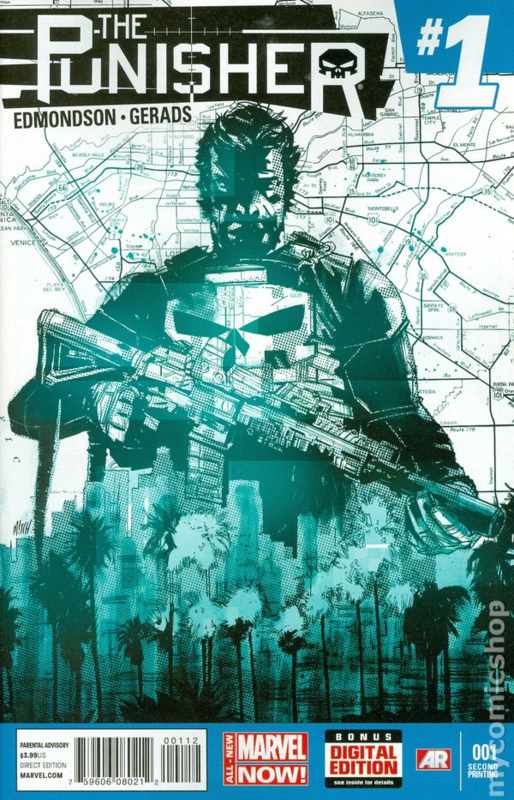 The Punisher is hunting down the Del Sol drug cartel, which has nefarious designs on LA. The Howling Commandos, in turn, have been tasked to hunt down the Punisher. The story unfolds at a steady pace, with other Marvel superheroes and supervillains making cameo appearances across multiple issues, touching on the intersection of crime, politics and war. Three-quarters of the way through, the story falls apart. The mastermind of the series, the one pulling the strings and supplying the cartel, is a high-ranking government official. In collaboration with a rogue general, he aims to instigate a crisis to force US military intervention at home. His reasoning? The U.S. has lost control of its own cities. White-caped maniacs, blind Halloween heroes, the public is lured into false security. They believe they're protected by a handful of freaks in costumes. Or freaks with PTSD. They have to be reminded why they need the government. Of why they need the infrastructure. We are a democratic republic with a >system of justice. We are not an oligarchy of vigilantes. As bad guy motivations go, this one is not totally insane. But why target Frank Castle--and only Frank Castle? Castle, in his own monologues, says he specialises in a specific kind of criminal: too vicious for the cops, too small-time for the true superheroes. Among Marvel superheroes, Castle is an underdog distinguished only by his hardware, his enormous body count, and sociopathy. There are many more superheroes more prominent than he is. If the antagonist wants to discredit and/or destroy superheroes, going after a single non-mutant non-superpowered costumed vigilante won't be enough. He has to show that superheroes are inadequate, that they will fail and the government is the solution to crime and disorder. For this plot to be believable, the MCU superheroes must be set up to fail in Los Angeles, with the Punisher alongside them. Yet throughout the series, only Frank Castle is singled out. Other superheroes, like the Avengers, are left alone -- and they don't even respond to the manufactured crisis. The two-minute hate in the series is aimed squarely at the Punisher; other superheroes are completely ignored. The antagonist's actions do not match his words. If the antagonist simply said he has held a grudge against Frank Castle since his military days, or if the Punisher were disrupting some mundane criminal scheme and needed to be disposed of, it would be far more believable. The story quickly goes off the wire. The Punisher hands off incriminating evidence to Captain America, but the main bad guy and his partner simply disappears. There is no mention of him being brought to justice. The Del Sol cartel is quickly dismantled. The Punisher is stabbed and left to die. In Issue 19 the Punisher is suddenly up and on his feet again. The world is coming to an end and the Howling Commandos recruit the Punisher for one last mission: to punish a terrorist cell in the Middle East and rescue American hostages. It turns out that The Punisher 2014 was actually concurrent with the Marvel Secret Wars timeline, and in the conclusion of the Secret Wars arc, the multiverse collapses. The incursion of Earth 616 and Earth-1610 promises to destroy the world. When the Kingpin organises a viewing party to watch the incursion, the Punisher massacres them all. None of this is mentioned. The reader is simply thrown into the deep end. No explanations are provided; you'll have to read other Marvel titles, or look up Infogalactic, to make sense of this arc. Further, the Howling Commandos appear because reasons (they don't aid the Punisher at all), the Punisher agrees because reasons (maybe there are no supervillains to kill), and the Black Dawn shows up because reasons (the story needs one last bunch of disposable mooks to kill). In Japan, when a manga is axed, the creators do their best to wrap things up. The story is rushed through, sure, but at least they try to create a satisfying ending. Here, the creators aren't even trying. The last two issues are just Frank Castle running and gunning through the dusty streets of Tikrit, accompanied by edgy monologue. The conclusion feels tacked on to the main story arc as a way for Castle to go out with a bang with the rest of the world. It ignores everything prior to the arc, as though there was no drug cartel in Los Angeles, no disillusioned police officer turned vigilante, no madcap conspiracy to discredit superheroes. There is no sense of closure, just outright abandonment. Instead of trying to force a link to the Secret Wars timeline, I'd rather the series spend those two issues wrapping up the main arc. The Punisher has to come to grips with the people he's alienated; he fights the remnants of the Del Sol cartel and their allied gangs; he allies with the superheroes and the military to restore order in Los Angeles, demonstrating that the people need both superheroes and mundane authority; and he teams up with the Howling Commandos to inflict a final punishment on the true enemy. That would have been more satisfying and thematically appropriate than a sudden trip to Tikrit to slaughter enemies who have heretofore been off the radar. As is, I can just about hear the Marvel editor calling up Edmundson and Gerads to say, "We want you to complete your current series by tying it in with the Secret Wars timeline." That call might have come in around issue #17 or #18, explaining the abruptness of the final two issues. And since in Secret Wars the Punisher has already slaughtered all the surviving supervillains, the creators had to pull a whole new two-parter out of thin air. The whole reading experience left me with a bitter taste in the mouth. The Punisher is still the vengeance-driven Marine of my youth, updated to reflect the story necessities. However, I was promised a military special operator and I got a generic Hollywood gunman. 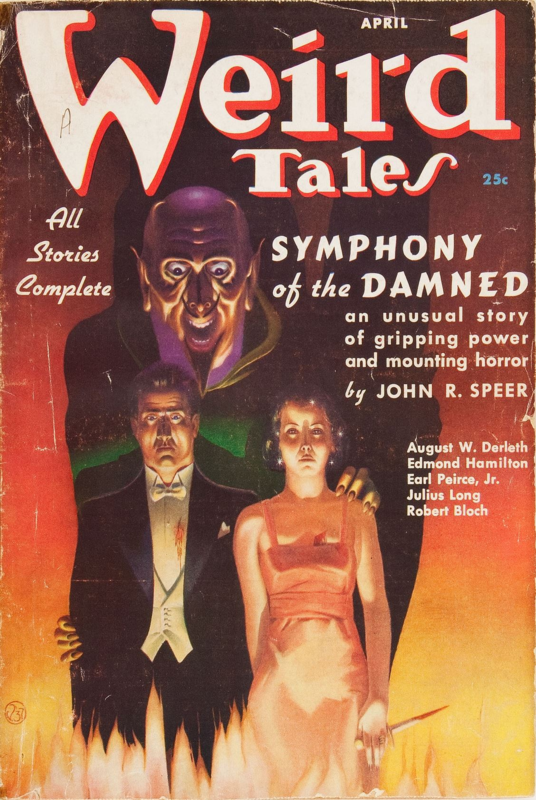 The first half of the series suggested a complex mix of violence and politics in a world populated by superheroes and supervillains, but the story ended sloppily. In the end, the Punisher (2014) didn't just punish criminals -- he punished the reader. If you like stories about operators operating operationally in a world filled with magic and demons, check out my latest novel HAMMER OF THE WITCHES.